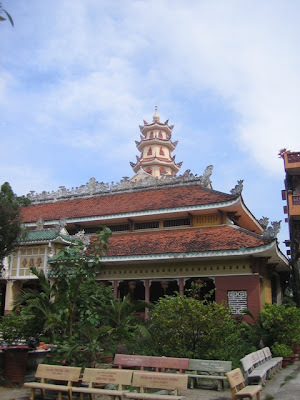 Pho Quang is a large-ish suburban temple in Ho Chi Minh City's Tan Binh district. When I first started coming to Vietnam it was situated in a semi-industrial area, surrounded by army and air-force camps. 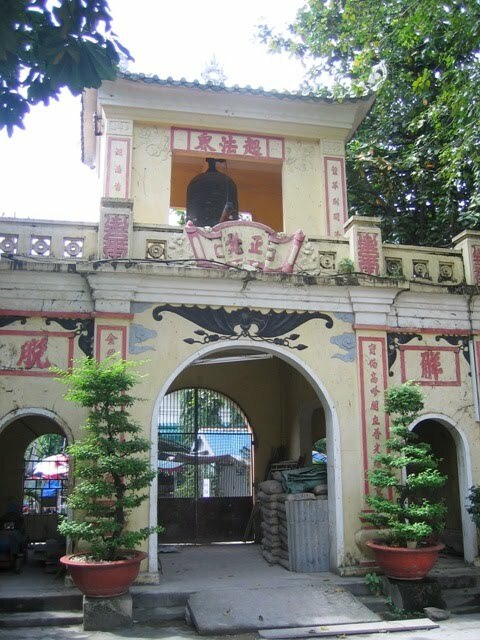 Now it is a densely populated urban zone, and the temple is actually quite hard to find, hidden away down several sub-streets. 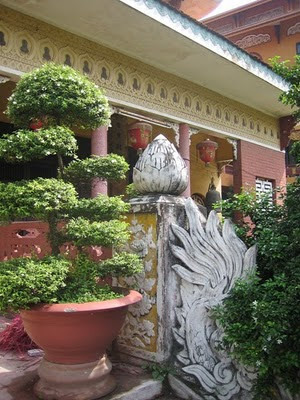 It has one of the most fantastic Buddhist supply shops in Vietnam, and is well worth visiting for that reason alone. The products are very reasonably priced, and clearly ticketed, so it makes shopping a breeze. The grounds are still quite spacious, and there are plenty of seats in the monastery courtyards, so it is a great place to spend an afternoon relaxing and people watching. There are any number of shrines and grottoes in the temple complex, and on sabbath days the place becomes quite crowded. 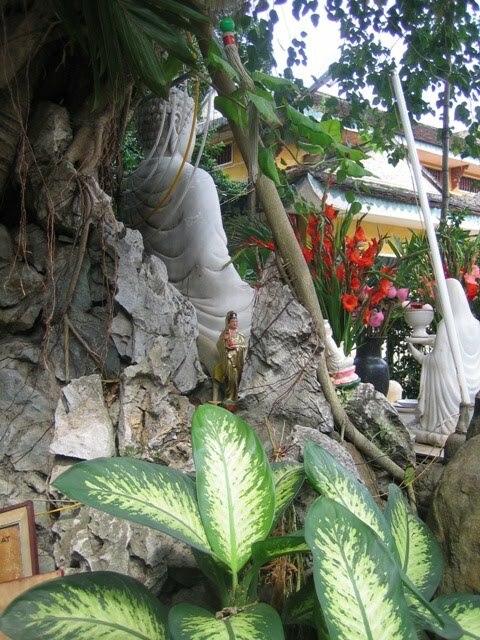 It is not really a place to come for Buddhist meditation, though in the Kwan Yin grotto quite a number of people attempt it, doing their best to block out the crowds and the chatter. The common areas were all paved long ago, so the garden, such as it is, is composed of potted trees, shrubs and bonsai. In the roots of the big trees that surround the outdoor shrines you can see a range of fascinating cast-off ritual objects. Buddhists believe that you cannot throw away a statue or picture that you used in worship, so when such things break or get too tatty, the faithful bring them to temples like this one and put the unwanted items at the base of the temple trees, this being seen as a sufficiently respectful way of getting rid of them. I assume that a couple of times a year the temple just rounds all this junk up and throws it out - I have never enquired about the actual ritual requirements of it all. It would be fascinating to know.